It’s a misconception that women with a small bust find it easy to shop for swimwear – Sure we can get away with many of the skimpy, trend led styles that larger busted women can only dream of wearing, but if you’re wanting swimwear that offers a little support and shaping (yes, a small bust also needs support!) it can be frustratingly difficult. Much of the swimwear available offers little lift or contouring and often ends up looking saggy and baggy on a small bust. Add to this the fact that many women who have a small bust also have a small back (I’m a 28DD and find the choices available in my size very disappointing) and you might understand that finding swimwear that fits well, stays put, and looks good is a frustratingly difficult thing to do! And as if that’s not enough, some women feel quite self conscious about the size of their bust and want swimwear that offers a little lift and shape. Well, if you can relate to all or some of this then I’ve got your back. 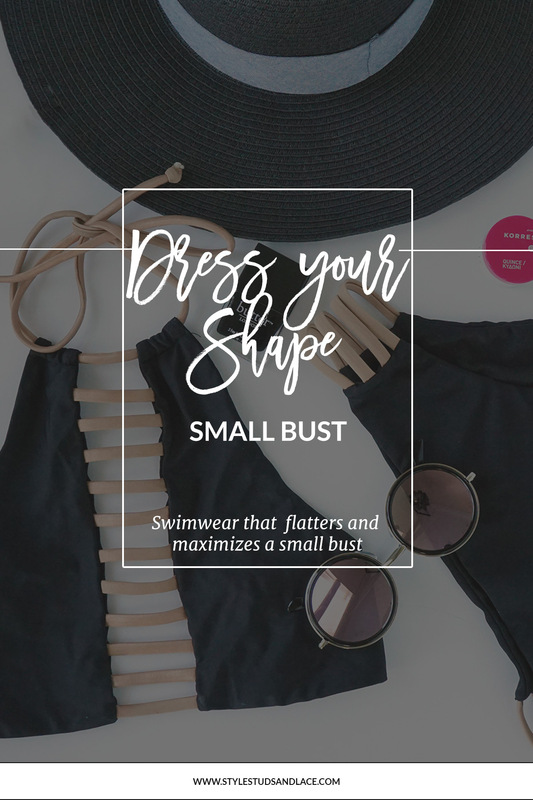 As a fellow small busted girl I understand your frustration and am about to share my tips on what to look for (and what to avoid) when buying swimwear, some tricks to help maximize and boost a small bust should you wish to, and I’ve selected 9 swimwear options that will fit, flatter, stay put and/or maximise a small bust. 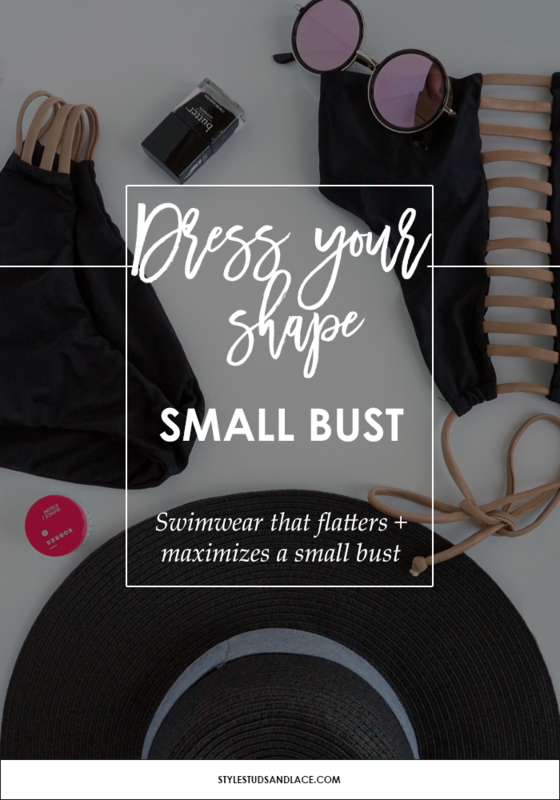 If you have a small bust, the chances are you struggle to find swimwear that fits you properly across the bust and around your torso which means they have a tendency to move around, especially when your swimming. The best way to avoid this from happening is to go for styles that have a tie fastening rather than a clip fastening. High neck styles are great for boosting a bust and are always a flattering option. Cup sized swimwear will ensure you get the best fit possible. There are a number of websites that offer bra sized swimwear in hard to find small sizes – Figleaves,(sizes A and upwards) Rigby and Peller (sizes A and upwards)and Maximum Cleavage (sizes AA and upwards) are some of my favorite retailers. Purchase separates rather then sets if you need a smaller size on your top half. Look for ruffles and detailing across the bust that will add volume. If you want to enhance your bust, go for swimwear with molded or padded cups that give a natural looking boost. Voda Swim (USA) and Max Cleavage (UK) offer a great selection of padded swimwear. If you don’t want to purchase new swimwear then add a little boost to your current pieces with swimwear friendly bra inserts like these silicone or foam pads. Deep plunging necklines that will narrow your torso and shrink your bust (they may also gape which isn’t a great look). Styles with a clip fastening that don’t allow for adjustment. ONE – This pretty halterneck bikini top flatters a small bust perfectly and has removable cups for added shape. TWO -The ruffle on this one shouldered bikini top is so pretty and does a great job of boosting a bust. THREE – This bikini is such a flattering option for small busted girls, and I love the wrap tie detailing that highlights the waist and enables you to get the perfect fit. FOUR – Having a small bust allows gives us the freedom to wear pretty swimwear like this which prioritizes fashion over function! This cute swimsuit is perfect for us small busted ladies thanks to the double tie closure that ensures the perfect fit and helps the suit to stay in place. FIVE – This wrap bikini top ties at the back to ensure the bet possible fit. SIX – high necked swimwear like this is my favorite style for a small bust! It’s so flattering and if you have narrow shoulders as well as a small bust they are the best way to broaden your torso. SEVEN – This three piece set has a gel filled bikini top for a natural boost and a tankini for those times you want a little more coverage. EIGHT – This pretty swimsuit is one for small busted girls only! The ruffles are bang on trend for 2017 and add volume to a small chest. NINE – If you want maximum cleavage then this padded bikini is for you! The padded cups visibly increase your bust size by 2 sizes and offer a natural look and shape. It also has 3 adjustable closure settings to ensure the perfect fit.